DETROIT YACHT CLUB DYC photo picture art photograph print for sale. 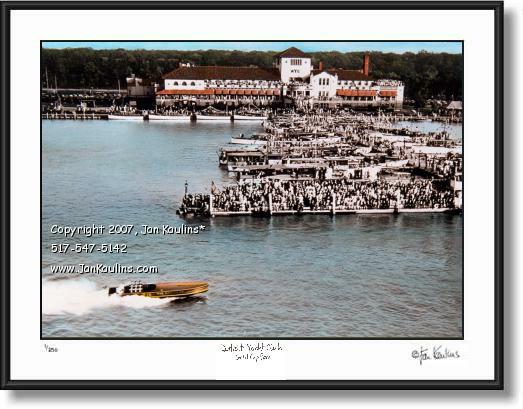 OLD VINTAGE DETROIT YACHT CLUB DYC GOLD CUP 1931 HARMSWORTH TROPHY RACE photo picture art print for sale. Detroit Yacht Club 1931 Harmsworth Trophy Race photo picture print poster art for sale. Historic vintage photo of old Detroit Yacht Club 1931 GOLD CUP HARMSWORTH TROPHY RACE GAR WOOD'S Miss America VIII at Detroit Yacht Club Gold Cup Race in 1931. This is a very rare color Detroit Yacht Club 1931 Harmsworth Trophy Race historic photo that is made from a black and white photo that HAS BEEN HAND-COLORED and printed by artist Jan Kaulins and available for sale for the first time. This vintage historic DETROIT YACHT CLUB picture photo is of The Detroit Yacht Club on Belle Isle, founded in Detroit in 1868, on The Detroit River during the historic 1931 Gold Cup Harmsworth Trophy Race on The Detroit River. You can see in the photo the docks are mobbed with fans cheering on their favorite powerboat racers during this very exciting era in Detroit history combining powerful motors, speed and world class excitement. Miss America VIII, shown in the foreground of this rare Detroit Gold Cup photo, was one of the line of famous 'Miss America's' financed and raced by legendary Detroiter GAR WOOD and designed by Napoleon 'Nap' Lisee. Gar Wood's team also raced in the famous Harnsworth competition and retired undefeated after 1933. Miss America VIII beat Miss England II in the 1931 race. The British challenger in 1931 was Kaye Don with Miss England II. Don won the first heat with Gar Wood finishing second in MISS AMERICA IX, while MISS AMERICA VIII came in third. In Heat Two of the 1931 Harmsworth, both Miss England II and Miss America IX jumped the gun and were disqualified. Miss England II rolled over in the first turn. MISS AMERICA VIII, driven by Gar Wood's brother George, shown here in this fabulous historical image, ended up as the WINNER of the coveted Harmsworth Trophy! Since the Harmsworth was a best two-out-of-three-heat contest, only Miss England II and MISS AMERICA VIII were eligible to run in Heat Three. Miss England II was too badly damaged to continue. So, George Wood and MISS AMERICA VIII ran the third heat unopposed and won the 1931 Harmsworth Trophy Race shown here in this exceptional historic photo. After his final successful defense with Miss America X in 1933, Gar Wood retired from racing. This photo of The Detroit Yacht Club on Belle Isle and The Detroit Gold Cup Harmsworth Trophy Race in 1931 with Gar Wood's Miss America VIII is a wonderful and most unique photo of this historic race and not available anywhere else except here from The Detroit Photo Gallery historical collection. In 1923, this present-day Detroit Yacht Club clubhouse was dedicated on Belle Isle; its construction had cost more than one million dollars, the work of architect George Mason, who also designed Detroit's Masonic Temple (the world's largest) and the opulent Gem Theatre in Detroit. By the end of the following year membership had reached 3000. This 1920s Mediterranean-style villa continues to be the largest yacht club in the United States. Prominent member and Commodore Gar Wood set world speed records in his hydroplanes, and with his Gold Cup victories brought the club to national and even worldwide prominence. Beginning in 1921, the DYC started sponsoring the hydroplane races. This 1931 Detroit Gold Cup Harmsworth Trophy Race featuring Miss America VIII, one of Gar Wood's most famous racing boats is a very unique photo of this historic event and a wonderful artistic treasure to display for any members of DYC or vintage hydroplane boat racing fans.